Delta Opioid Receptor 3-17 staining in rat dorsal horn. Data courtesy of Dr. Janet Keast, University of New South Wales. 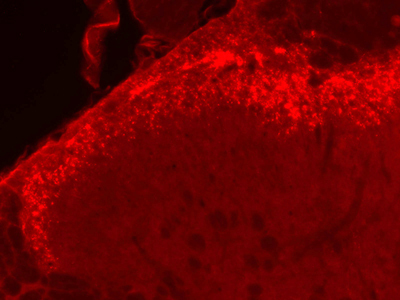 Double immunofluorescence labeling of VR1 C-terminus (TRPV1, GP14100) and Mu Opioid Receptor in the DRG and spinal cord. 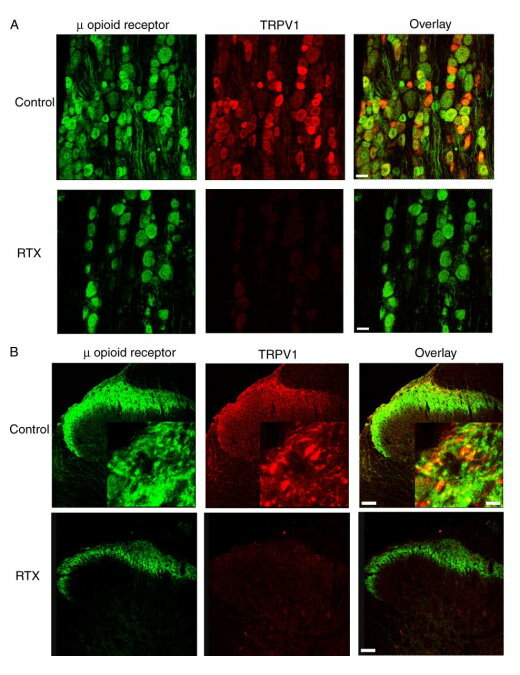 Confocal images showing the effect of RTX on u opioid receptor- and TRPV1-immunoreactive DRG neurons and afferent terminals in the spinal cord. A: representative confocal images showing u opioid receptor (green) and TRPV1 (red) immunoreactivities in DRG neurons of one vehicle- and one RTX-treated rat. Scale bar, 40 um. B: confocal images showing u opioid receptor (green) and TRPV1 (red) immunoreactivities in afferent terminals in the spinal dorsal horn of 1 vehicle- and 1 RTX-treated rat. Scale bar, 80 um. Inset: high-magnification images (scale bar = 5 um) showing co-localization of u opioid receptor and TRPV1 immunoreactivity in the lamina I. Co-localization of the u opioid receptor and TRPV1 immunoreactivity is indicated in yellow when 2 images are digitally merged. All images are single confocal optical sections. Shao-Rui Chen and Hui-Lin Pan. (2005). Loss of TRPV1-Expressing Sensory Neurons Reduces Spinal u Opioid Receptors But Paradoxically Potentiates Opioid Analgesia. J Neurophysiol 95: 3086 –3096. doi:10.1152/jn.01343.2005. Confocal images showing distribution of µ opioid receptor and synaptophysin immunoreactivities in the CeA ( central nucleus of the amygdala). A, immunoreactivities of synaptophysin (a, red) and µ opioid receptor (b, green) in the CeA. c, merged images from a and b; colocalization of µ opioid receptors and synaptophysin is illustrated in yellow. B, confocal images showing spatial relationship of a biocytin-labeled CeA cell (a, blue) with synaptophysin (b, red) and µ opioid receptor (c, green) immunoreactivities. The presynaptic colocalization of the µ opioid receptor and synaptophysin is indicated by color change (yellow, d) in merged images of a, b, and c. C, another biocytin-labeled CeA cell showing a presynaptic location of the µ opioid receptor immunoreactivity. Images are in all cases single confocal optical sections.